Instructions are included in the pattern for making both the original size and a giant version. The pattern is essentially the same for both (except for a couple of really minor embellishment details). 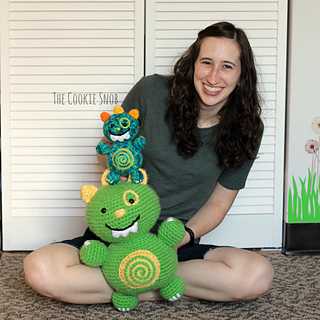 Exact dimensions will vary depending on how tightly you crochet and which yarns you use, but the smaller monster is about 8” tall and the larger monster is about 15” tall. But gauge isn’t crucial for this project, so you can play around with different hooks and yarns to make different sizes (just make sure your stitches are tight enough to keep the stuffing in). To make the smaller size monster, you’ll need 1 skein of worsted weight (4) yarn in the main body color and small amounts of worsted weight yarn in accent colors. I made mine with a size E (3.5mm) crochet hook and 10mm safety eyes. I would recommend this for intermediate level crocheters and above, who are familiar with techniques such as the magic circle and surface crochet. A bonus photo-tutorial for creating invisible decrease stitches is included as part of the pattern.